It’s Cyber Monday! The day in which people spend their time (and money) shopping online for Holiday gifts. I intend to do a little of the same, though I would encourage you all (who are reading this) to browse the items in my new storefront on jmdesantis.com: jmdesantis.com/shop/. Just launched last week, it has a number of exclusive items available (including my original Inktober 2017 pieces, many of which have already sold) as well as sales on back-stock of select prints. But, if you’re new to this blog or even if you’re not and you need a little reminder, that’s not all I’m offering online this Holiday season. Aside from the new store, as I’ve mentioned before, I’m also open for commissions through January 31, 2018, after which point I’m going to raise my prices (for a number of reasons already detailed in previous posts, but including that I wish to spend more time on them, individually). Both the current prices and tentative price-raises are listed on my Commissions Page (jmdesantis.com/commission-requests). So if you’d like a commission at these “older” prices, get on the list now. Space is filling up, but there are still some available for December and January. Last and also again, this is the last week (last few days even) to have your name included on my long-coming sketchbook and the Inktober collection I’m printing for next years’ conventions (and possible sales through my website). 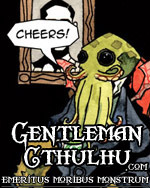 If you’d like a copy early and to have your name included as a supporter, join my Patreon page (patreon.com/jmdesantis–which includes early access to Gentleman Cthulhu and other works) by December 1st. At just $3.00 you can have your name in both books; $5.00 includes a digital copy; $15.00 gets all of this plus a physical, signed copy of both books. I’m keeping it brief this week, so until next time, Happy Cyber Monday and enjoy shopping here and elsewhere!